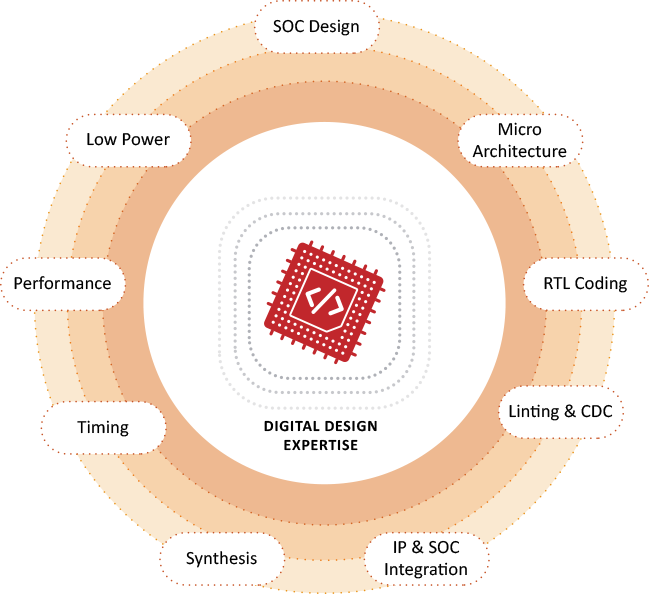 From concept to silicon, we provide expertise for development in IP/ASIC/SOC/FPGA. We understand the relationship between specification and implementation, and know how to partition designs and make trade-offs necessary for performance, power and area. Our team of engineers are fully capable of taking responsibility of RTL development for IP/ASIC/SOC/FPGA using Verilog, VHDL and System Verilog. With our extensive domain knowledge in developing IP/ASIC/SOC/FPGA on latest interface protocols e.g. Ethernet, SAS, FC, PCIe, USB, SATA, MIPI, DDR, AMBA etc. we can help integrate IP into larger subsystem or complete SOC with other blocks including processors.